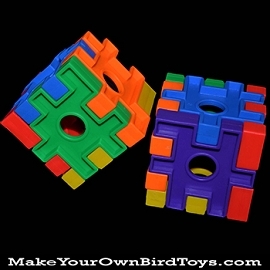 Parrot's Choice Foraging Blocks were designed exclusively for MakeYourOwnBirdToys.com by enrichment guru Kris Porter. 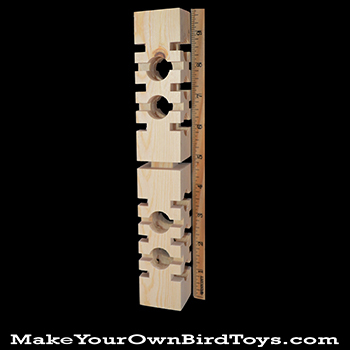 The foraging blocks, available in three sizes, are packed with great features like nested holes and wide cuts that make it easy to insert items like nutriberries and sliced fruits and veggies. 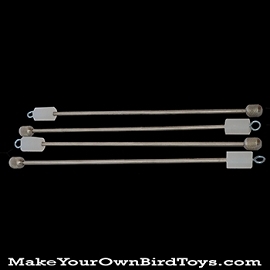 Hide the treats behind crinkle shred and tie on some of your bird's favorite toy parts to increase the foraging complexity. 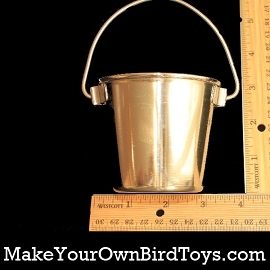 The Medium Parrot's Choice Foraging Block measures 9.5" x 1.5" x 1.5" and comes with a nickel plated screw eye and pear link. I thought this ws a great idea, however when I received it, my first thought was that the wood was very soft. 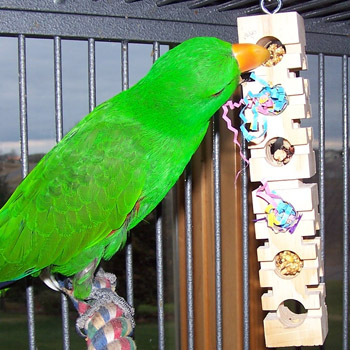 Sure enough, after just one use while we were out of the house for a few hours, my 9 month old eclectus had practically destroyed it while getting his treats out. It's practically useless now. 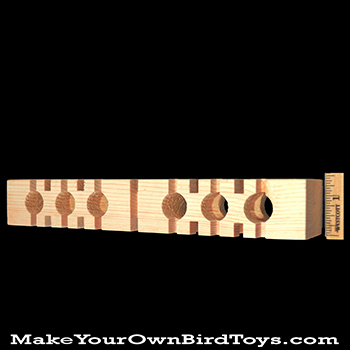 I bought a similar type product from another website and my African Grey Apollo wont touch it , received the medium parrots choice foraging block and I can say with total satisfaction these are wonderful . I put his favorite treats in and hide them with crinkle shred and I use the little channels to wedge things for him to work at getting out . He has since destroyed the first one but is enjoying his second. This will be a favorite . Q: When will this be back in stock? A: Thank you for your inquiry about this item. 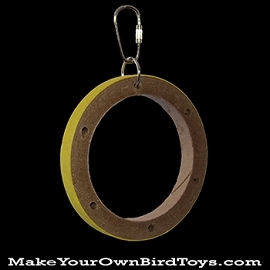 Unfortunately we have not received an availability date yet from our supplier. We hope to have this resolved within a couple of months. 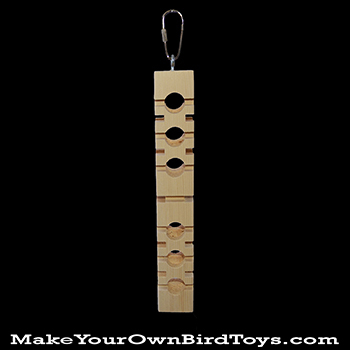 The Medium Parrot's Choice Foraging Block measures 1.5 x 1.5 x 9.5" and comes with a nickel plated screw eye and pear link. 9 points will be rewarded to you when you buy this item. Note: If the system states zero points don't worry, this occurs when the unit price is less than $1. Points will be awarded based on the final quantity added to the cart.